New York, January 31, 2014 - Global Finance has released its rankings for the Best Treasury and Cash Management Banks and Providers by category and region—to be published in an exclusive survey in the March, 2014, issue. 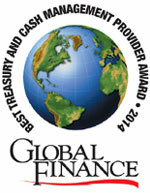 We have selected an overall global winner and a global winner for the Best White Label Service Provider category. We have also selected regional winners in North America, Western Europe, Central and Eastern Europe, Asia-Pacific, Latin America, Middle East, Africa and the Nordic region. Additionally in each region, winning banks have been selected across four categories encompassing payments and collections, liquidity, risk management, and money market funds. We have also selected the Best Treasury Management Systems & Services providers across 20 categories, including one new category, Best Cloud-Based Offering. Global Finance used a multi-tiered assessment process—which included a readers’ poll, input from industry analysts, corporate executives, technology experts and independent research—to select the best providers of treasury and cash management services. A variety of subjective and objective criteria were considered, including: profitability, market share and reach, customer service, competitive pricing, product innovation and the extent to which treasury and cash management providers have successfully differentiated themselves from their competitors around core service provision. This translates into greater competition among providers. The winners in our annual Treasury & Cash Management awards are those that offer sophisticated regional and/or global solutions with a best-of-breed technology backbone and a client-centric front end. An Awards Ceremony for all winners will be conducted at the same time as the October, 2014, SIBOS conference in Boston, MA. More details to follow.